We can just imagine the pitch meeting at the movie studio: "We'll, people love the classic Universal monsters, so why wouldn't they love a cartoon where they're a rock group?" Well, lots of reasons, actually. Regardless, somehow "The Groovie Goolies" came into existence. 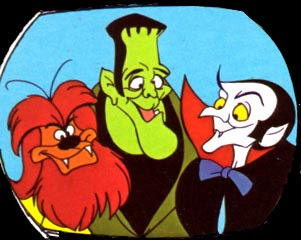 From 1970 to 1972, Drac, Frankie and Wolfie (plus loads of other formerly creepy creatures of the night) were billed as cousins of Sabrina, the Teenage Witch, and all lived together at Horrible Hall, a boarding school for monsters. Sure, various blood-sucking undead all living together isn't exactly natural. Even more unnatural? Having a laugh track on a cartoon. Do you remember this musical monster mash-up? One of the most surreal experiences I've ever had was being in Belgium in the early 80's, and turning on the TV at the hotel, and the Groovie Goolies was on, dubbed in Dutch.